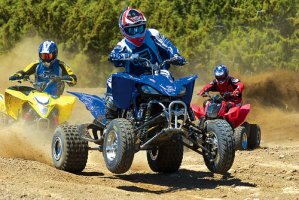 ATVs have become extremely popular over the recent years. All-terrain vehicles, which come in many different sizes and shapes, are usually used for recreation and competition racing, and also as work tools, especially in the farming industry. Export Portal ATVs Online Store is your online destination for your all-terrain vehicle needs. Sell your ATV with us or search hundreds of new or used all-terrain vehicles for sale including three-wheelers ATVs, four-wheelers ATVs, six-wheelers ATVs, Dune Buggy ATVs, Sand/Rail ATVs, Work/Utility ATVs, Golf Carts and other ATVs with worldwide shipping. Sell or find all your favorite ATV makes like Kawasaki, Yamaha, Honda, Bombardier, Can-Am, Arctic Cat, Suzuki, Joyner, KTM, Polaris, and even more. Export Portal also features all-terrain vehicle reviews as well as seller reviews that will help you make the right decision on the path to purchase. Use the filter options such as ATV make, ATV model, price, country, wheel brand to narrow down your search results. Export Portal is your best source to start selling and buying online.